Press and Media Coverage, click here. "This is an amazing, inspiring, and heartwarming story! It's about harnessing the power not just of the wind but of imagination and ingenuity. Those are the most important forces we have for saving the planet. 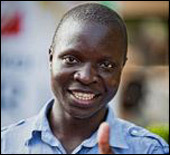 William Kamkwamba is a hero for our age." "I first met William on stage at TED. At the time his English was faltering and he was understandably nervous. It didn't matter. His story, told in just a couple of minutes, was both astonishing and exhilarating. This book proves what those few minutes hinted at: a remarkable individual capable of inspiring many to take their future into their own hands." "In this book, the spirit, resilience and resourcefulness that are Africa's greatest strengths shine through. My heart was gripped by the tale of how William's family pulled through the famine, and it was lifted up by the tale of how his determination brought light to his home and hope to his village. THE BOY WHO HARNESSED THE WIND is a remarkable story about a remarkable young man and his inquisitive and inventive mind." "William Kamkwamba is an alchemist who turned misfortune into opportunity, opportunity beyond his own. The book is about learning by inventing. William's genius was to be ingenious." "This book traveled with me from Copenhagen to San Francisco to the South Fork of the Flathead and tells the story of how the battle for saving our planet and meeting the needs of humanity will be won by individuals like William Kamkwamba. His determination to improve his corner of the world is a testament to the power of a dream and the freedom that comes from accomplishing a sustainable way of life. Read this book, act on its message and pass it on." "William will challenge everything you have thought about Africa, about young people, and about the power of one person to transform a community. This beautifully written book will open your heart and mind. I was moved by William and his story and believe you all will. Essential, powerful and compelling." "I loved this enchanting story of a humble young hero from an impoverished African village who accomplishes a miracle with scrap materials and unstoppable enthusiasm. What an inspiration!" "This book is an inspiring testament to the ingenuity of Africans. If we can develop more innovative leaders like William, Africa will finally stand on its own two feet." "This book is inspirational. What William did took nothing more than initiative and a little learning, yet he changed his village and his life. There's never been a better time to Do It Yourself, and I love how much we can learn from those who often have no other choice." "Wonderful! I challenge you to read this story of one young man changing his corner of the world with nothing but intelligence and perservance and not come away more hopeful about the prospects for a brighter, greener future." "Much more than a memoir, this is a snapshot of life as a precocious teenager in contemporary Africa, and an affirmation of the notion that talent, beauty, and brilliance are distributed in equal measure around the world, even if opportunity is not. This is a story that hums with the excitement of an individual who, like the continent where he was raised is poised for greatness." "Beyond opening the door to a nascent genre of African Innovation literature, The Boy Who Harnessed the Wind makes excuses about why Africans can't change their fates untenable. This potent, powerful, and uplifting message is the heart of Williams Kamkwamba's courageous story." "I was moved first to laughter, and then to tears by William's explanation of how he turned some PVC pipe, a broken bicycle and some long wooden poles into a machine capable of generating sufficient current to power lights and a radio in his parents' house: "I try, and I made it."" "A rare and inspiring story of hope in rural Africa, a true story of youth challenging and winning against all of the adversity that life throws at it. William represents a new generation of Africans, using ingenuity and invention to overcome life's challenges. Where so many tilt at windmills, William builds them!" "An inspiring tale of an African Cheetah -- the new generation of young Africans who won't sit and wait for corrupt and incompetent governments -- or vampire states -- to come and do things for them. Here is one who harnessed the wind to generate electricity for his village -- on his own."